Like the protagonists of most of Bellow's novels - Dangling Man, The Victim, Seize the Day, Henderson the Rain King, etc. - Herzog is a man seeking balance, trying to regain a foothold on his life. Thrown out of his ex-wife's house, he retreats to his abandoned home in Ludeyville, a remote village in the Berkshire mountains to which Herzog had previously moved his wife and friends. Here amid the dust and vermin of the disused house, Herzog begins scribbling letters to family, friends, lovers, colleagues, enemies, dead philosophers, ex- Presidents - anyone with whom he feels compelled to set the record straight. The letters, we learn, are never sent. They are a means to cure himself of the immense psychic strain of his failed second marriage, a method by which he can recognize truths that will free him to love others and to learn to abide with the knowledge of death. In order to do so he must confront the fact that he has been a bad husband, a loving but poor father, an ungrateful child, a distant brother, an egoist to friends, and an apathetic citizen. Herzog is primarily a novel of redemption. For all of its innovative techniques and brilliant comedy, it tells one of the oldest of stories. Like The Divine Comedy or the dark night of the soul of St. John of the Cross, it progresses from darkness to light, from ignorance to enlightenment. Today it is still considered one of the greatest literary expressions of postwar America. ©1992 Saul Bellow (P)2009 Blackstone Audio, Inc. 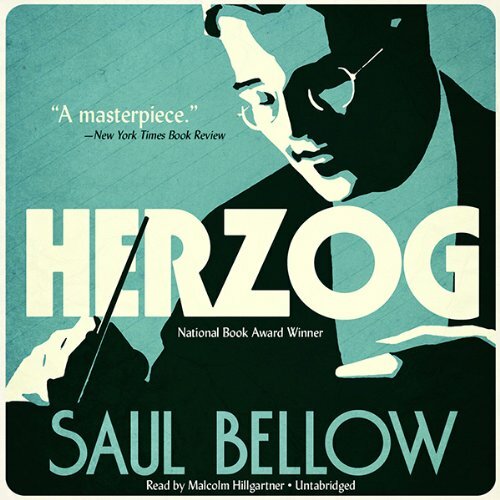 In one of his finest achievements, Nobel and Pulitzer Prize winner Saul Bellow presents a multifaceted portrait of a modern-day hero, a man struggling with the complexity of existence and longing for redemption. As I rolled through this listen I kept waiting for for the profundity to hit. Surely there must some great, self-shaking thought just around the corner or maybe somewhere in Chicago. But everyday seemingly regular people, especially our mildly eccentric hero, never do anything really unexpected or extraordinary. Then it begins to sink in. This isn't about the extraordinary. It really is about the common, ordinary life of one man struggling with things we [all] struggle with. The writing is like yeast added to water and that to flour. At first you don't really notice anything. But given time, it begins to grow. The thoughts on relationships are sad and funny at the same time. Why do we make bad choices? We just do. I would add this book to a "must read" list. The narration is perfect for the material and not overdone in the least. Highly recommend if you like books above the level of the trashy novel but want something easier than Dickens! I spend a lot of time arguing that you can get as much from an audiobook as from a paper book, but Bellow tests that claim. This is a powerful book about a man who has a hard time pulling himself out of the texts of his life and into his real life. It's slow -- slow in the sense that not that many things happen -- but it's also raging in the way we're in and out of Herzog's mind. His imaginary letters (some real) show him trying to get traction in the real world as he flees to the world of writing. As a result, it's sometimes hard to listen to a novel that's so much about the business of writing. I often wanted to stop and re-read a sentence -- Bellow is a master of the sentence -- and I missed a sense of the textual nature of Herzog's various letters. Hillgartner can signal that we're into a new letter, but I don't think he can get across the effect of seeing the heading and recognizing the deterioration or recovery of Herzog's mind. And that's a crucial distinction because I think there are ways in which Herzog's mind (as caught in the text) is a different character from Herzog himself (as caught in his own story). This is an excellent book written by one of the titans of literature. The story is good enough but there is so much more to think about here. This is a dense book that I will have to take the time and read on paper just to make sure I've caught everything. I'm not sure how much empathy poor old Herzog would get if you're not a middle-aged guy. If you are unfortunate enough to be a middle-aged guy, then this book will resonate big time. Bellow has managed to capture with exquisite finesse what we all feel, while encapsulating it in a very specific story of a particular time and place. It is masterfully done. If you are fortunate enough not to be a middle-aged guy, you will hopefully come away with a better understanding of how they got to be the way they are. Ultimately, this is a story about reconciling the elements of your life and moving on with a new sense of equanimity. In other words, a mid-life crisis story. On a minor note, it is also a precious time capsule for those of us who remember Chicago in the early 1960s. Would you listen to Herzog again? Why? Yes. In fact, I already have. I just read a review of this book that said it is "dull, dull, dull." While everybody's entitled to his/her opinion, if this book is "dull," it's dull in the same way that all classic literature is dull. I suppose you could say the same for "1984," "The Grapes of Wrath," "Huckleberry Finn," and "The Sound And The Fury." Mr. Bellow, winning a Nobel prize and all, probably doesn't need defending, but when I see reviews calling the very best books dull, I see red. Jewish angst at its finest! Malcolm hillgartner's narration catches the manic intensity of Herzog's rants (sections a visual reader might choose to skip) without being annoying. The narration also amplified the touching aspects of the story and its protagonist. I feel I have explored the personality of Herzog more deeply than I have most actual people I know. And this exploration has shown me much to like, admire and sympathize with. An intense book that I am glad I read. Moses Herzog after a second divorce is in mid-life crisis. He writes letters to all sorts of people who he feels have harmed him…both living and dead. The book is masterful, great story, characters and dialogue. As the book progresses, Bellow slowly shows us Moses' past including the poverty of his immigrant Jewish family from Russia to Canada and then Chicago, his marriages and infidelities, and a sexual attack as a young boy. I read a critique of how this book advanced many Henry James' techniques especially the unreliable narrator. The book slowly reveals Moses unstableness as he madly writes letters that he will never send to people both living and dead. The story weaves threads together incredibly using this technique. In the end, Moses declares he'll stop his letter writing and start living - by fixing up his home in the Berkshires, and giving love another shot with Ramona. When listening to the sample, I thought this reader would be OK; but after a few chapters, I couldn't stand to listen any more. I had to stop before this reader entirely destroyed the book for me. I loved this novel when I first read it many years ago--Herzog's urgent letters to everyone, the humor. There's nothing wrong with the quality of Hillgartner's performance but I found his interpretation wrong. He pounds out the words, ignoring any poetry in Bellow's writing. The constant low-level irony allows no room for the places where irony really belongs and it provokes irritation at Herzog, even dislike of this character. In Bellow's hands, not Hillgartner's, Herzog is more likely to provoke empathy for his vanities, foibles, and many errors--his humanity. Given his reputation, and the high esteem in which he his held by writers whom I hold in high esteem, I always feel like I should like Bellow more than I do. Herzog is a good book, but (for me) not a great one. I'm tempted to blame my ho-hum reaction on the fact his characters often seem less like real people and more like puppets for the author, through which he can espouse some point or another. But if I'm honest that same argument could be made with even more accuracy at authors I love like Pynchon and DeLillo. Maybe it's just that what he has to say isn't all that interesting. It could be that I find language is unmoving. There are occasional phrases that seem clever, but there's no musicality. Whatever it is, Bellow just leaves me a bit bored. There must be a sub textual level to this novel that I just missed. Taking it at face value, I found it a boring account of an uninteresting person. Sure, Herzog has trouble with life and love, but who doesn't? He's a well-educated, middle-class guy with two ex-wives, a kid he's not as close to as he'd like to be, and many girlfriends. I just found him and his plight quotidian. I forced myself to finish this. While I didn't think Seize the Day and Henderson the Rain King -- the only other Bellow works I've read -- were masterpieces, I thought they were good reads. This one left me scratching my head as to why it's so highly acclaimed.